For many couples, the inability to conceive is one of life’s most frustrating and disappointing experiences. Often, a woman seeks the care and guidance of her gynecologist for an initial work-up. Important testing often includes blood tests, an ultrasound, an X-ray of the uterus and fallopian tubes, and a test of the partner’s sperm. When basic tests are normal, it is common for women to be prescribed an oral fertility pill called clomiphene (or ‘Clomid’). Unfortunately, in this situation, a month of clomiphene treatment typically provides just a 2 to 10% chance of conceiving. Additional months of taking clomiphene don’t necessarily increase the odds, and the chances of getting pregnant can be zero if the tests noted above are abnormal or not performed. Clomiphene can have side effects, and its use should be closely monitored to minimize the chance of high risk multiple pregnancy. A woman’s age is also a vital factor to consider, since numerous studies demonstrate that female fertility starts to decline after age 30. We believe it is vital for couples that are fertility-challenged to seek the opinion of subspecialists in reproductive endocrinology and infertility. Patients often seek out a practice like ours through direct doctor referrals, educational seminars, the Internet, and word-of-mouth. Every year, Reproductive Associates of Delaware diligently helps hundreds of couples achieve successful outcomes. 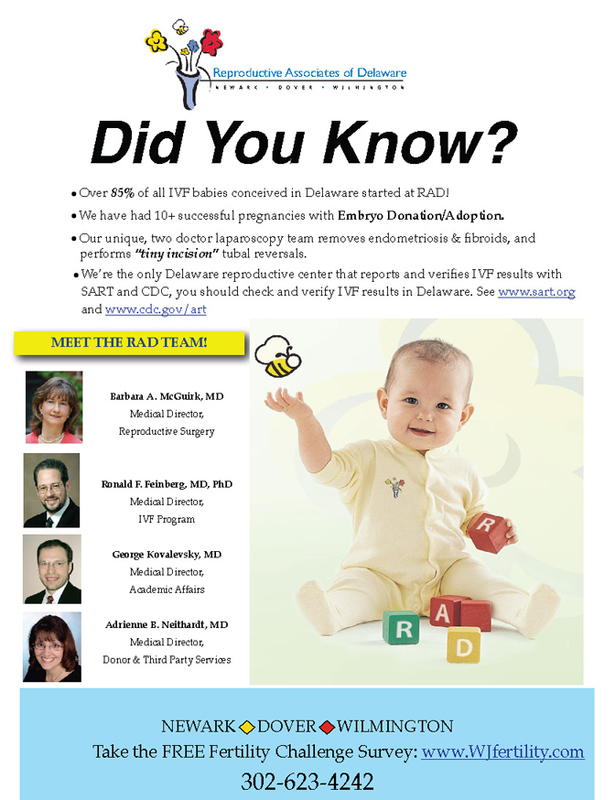 Since 1995, when Dr. McGuirk started this practice, our “baby count” totals are in the thousands. What is the secret recipe for our success? It is none other than careful attention and treatment of the specific underlying problems that cause fertility challenges — endometriosis, adhesions, fibroids, polyps, male factors, and a lack of ovulation commonly seen in polycystic ovary syndrome (PCOS). Many patients assume that going to a fertility specialist means they will automatically need expensive treatments like in vitro fertilization (IVF). In truth, almost two-thirds of our successes occur following directed approaches such as outpatient minimally-invasive laparoscopy, hysteroscopy, and carefully monitored ovulation induction / insemination cycles. More about this, and customized affordability options for fertility care in an upcoming article. Board Certiﬁed: Reproductive Endocrinology and Obstetrics Gynecology. Reproductive Associates is proud to have some of the ﬁnest and brightest endocrine and andrology lab staff, Linda Morrison, M.T., Stacey Carney M.T., Heather Ray B.S., Cai Wang MD, and Caitlin Boylan B.S. who are led by our Lab Director, Marc Portmann, M.T., MHA. Our facility is also home to four of Delaware’s ﬁnest practitioners: Nancy Lorber, CRNP, Melissa Aiken PA-C, Rhonda Wright PA-C, and Susan Carr, CRNP. For your convenience we have 3 locations across Delaware to serve you: In Newark on the campus of Christiana Care, Dover, at Eden Hill Medical Center and at Silverside Medical Plaza in NorthWilmington. Please call 302-623-4242 to make an appointment. Please visit www.wjfertility.com to take our fertility challenge survey, or visit our website www.reproductiveassociates.org to learn more about our practice.